A deeper insight to the New CCF Skill Chart! What is the New Skill Chart? Well, easily explained it's a way of validating that all your hard training is really paying off. Benchmark workouts and Benchmark lifts are still great ways of seeing your improvement, but with the new skill levels you can also easily see how day to day movements in class is taking you to new levels of your fitness! This Saturday the coaches will focus a little bit extra on getting you up to par with the new chart and we will start with a 10-15min little workshop where we go in depth on how to implement the chart in your training. We will then be around to help you tick off as many markers as you can, but more importantly than so: help you with progressions for the ones you yet don't master. Below are a few things we will touch base on this Saturday and a few more on the Skill Chart in general. Skill on the Chart can only be ticked off by your coach: - If the coach was observing. - If movement is with "Good Form & Virtuous", the coaches will be very strict with this. You can only get one Skill ticked off if the ones on the same movement/skill have been signed off earlier: - We want our athletes to understand these progressions and see that Basics is super important for performance. - Logical Exceptions: i.e. If you do 15 KBS with 32kg, it is assumed that you can do it with 24kg.. Many of these things are related, work on the basics often and you will improve across the board! 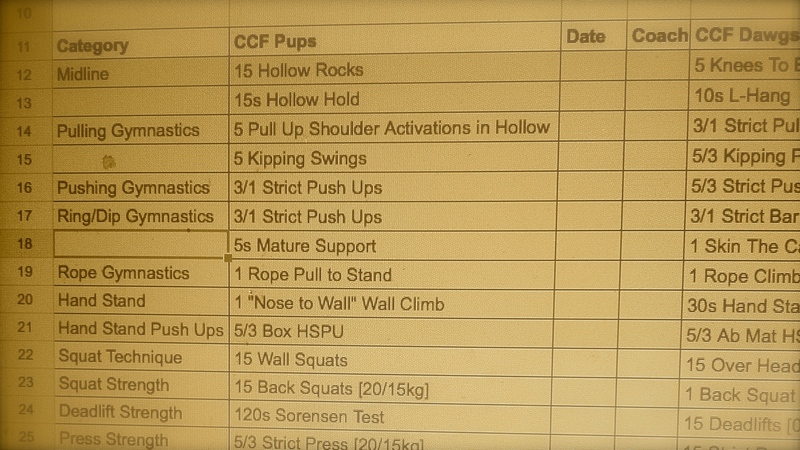 - Can't perform 5 Shoulder activations in a Hollow, or 5 Kipping Swings? Go back and practice the Hollow on the ground! - Having trouble with Ring Dips? Practice being in the rings will definitely help, but so will getting better at your pushups with perfect form. Trust us enough to avoid trying to tick off HEAVY LIFTS outside of the programming that we are providing you with: - There are strength progressions in the CCF programming that is proven to work in terms of increasing strength at a good level and pace, but also doing so while keeping you safe. - Adding extra strength work too often may be very counterproductive, or even dangerous, due to the total load. - The Open gym should be providing you with time and coaching to improve on your lifts, but most times it won't be trough going for MAX, but rather giving you stuff to work on that is helping you in the long run. Use the Open Gym! - The coaches are there to help you pretty much every Saturday, use their knowledge and ask for help with things you aren't great at. - Work on the things you are the worst at, trying to improve an already super impressive deadlift won't get you that first muscle up.. - That said, once in a while throw in a cool CrossFit WOD and smash it with your friends - WHAT you do is important, but DOING it at all is more important. Consistency is everything. Any other questions can definitely be brought up with your coaches. Come in on Saturday, get YOUR printed version of the Skill Chart, and we will smash some skills together! PS. The Skill Chart is under constant evaluation, if we see a need for it certain numbers can be changed in our pursuit of a very well balanced pool of athletes at Cape CrossFit.